February and March 2013 - Hullabaloo Music popped up at Meavy and Yelverton Pre School, celebrating Chinese New Year, World Book Day and went down on the farm driving our tractors and making yummy butter to eat at snack time! January and February 2013 - Hullabaloo Music will be popping up at the Tamar Valley PreSchool and going "Under the Sea"
Jan 16th, 23rd and 30th, Feb 6th and 13th. January 2013 - Hullabaloo Music becomes a Pop Up Music Class! After six happy years of Hullabaloo fun, I have made the difficult decision to stop running regular weekly Hullabaloo Music sessions, as of January 2013. I would like to thank everyone who has attended Hullabaloo sessions during the last six years, especially all the wonderful children who have made the sessions so special. I have been completely overwhelmed by all your kind and generous wishes and I am so pleased that you have all enjoyed Hullabaloo as much as I have. It has been a pleasure to shake eggs with you all!!! Due to popular demand Hullabaloo will continue as a Pop Up Music Class. Hullabaloo is also available for First Birthday Parties, but is not currently offering parties for older children. If you are a Preschool, Toddler Group, Children's Centre, Organisation, or simply a group of parents, carers or childminders who want a Hullabaloo Session in your weekly coffee get together, please get in touch. Sessions last either 30 or 45 minutes with a theme of your choice. I can offer special sessions such as Chinese New Year, Diwali, Easter and many more! Hullabaloo will pop up at a hall, your house, or garden (Summer only!!) and can provide both baby and toddler sessions. September and October 2012 - Mel can't wait to start Around the World themed sessions with the children at Calstock Under Fives! July 2012 - Mel loved sharing all her teddies with the children at the Gulworthy and Lamerton Under 5s Summer Party! 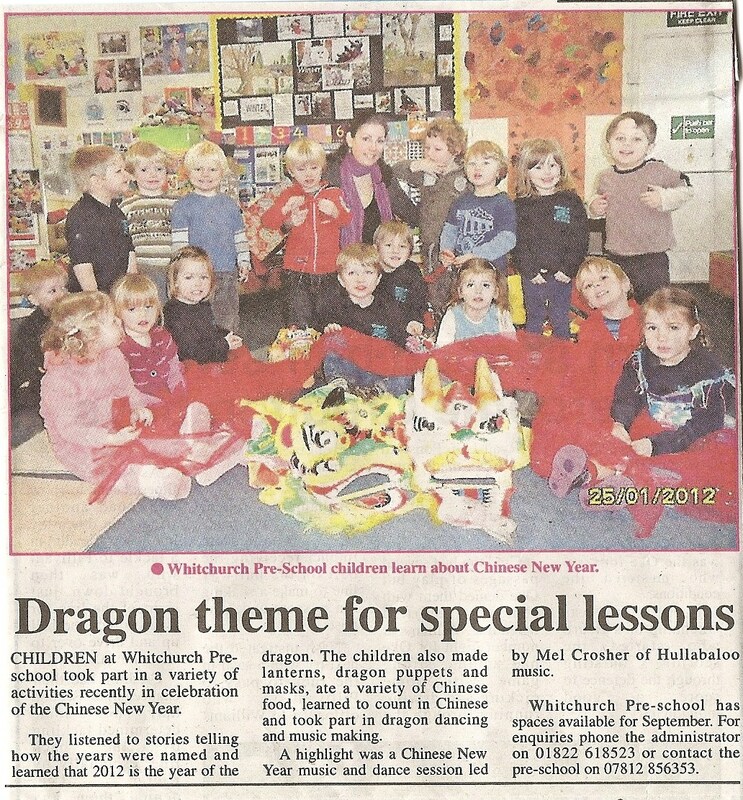 January 2012 - Kung Hey Fat Choi.......In The News!!! December 2011 - Hullabaloo had lots of fun at the St Cleer Preschool Christmas Party!